Specifically designed to remove radon and other volatile compounds from residential well water. AeroSparge 2000® is a product of New England Radon. Ltd. This state of the art and innovative spray and diffused bubble system has proven to be the best method for removal and reduction of gases from potable water. Efficient for Hydrogen Sulfide, Methane, VOCs, odors and up to 99+% Radon removal. 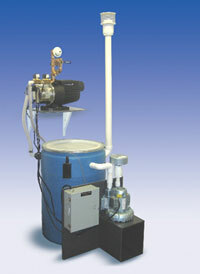 The AeroSparge 2000® system uses the combined techniques of vigorous spraying and diffused bubble aeration to separate the radon or other volatile organic contaminants from the water. The treated water is repressurized and made ready for use. The contaminants released from the process are then exhausted safely through a two inch diameter pipe to the outside air. How Does AeroSparge 2000® Work? AeroSparge 2000® has been specifically designed to remove radon and other volatile organic compounds from residential well water. From the existing well water pressure tank in your home, water enters the AeroSparge 2000® and is sprayed through a special clog resistant nozzle. The nozzle creates a cone shaped spray of mist of very fine droplets; this process exposes the maximum amount of liquid surface to the air stream, hence removing a significant amount of existing radon. As the water fills the AeroSparge 2000® tank, high pressured, filtered air is blown through specially designed spargers that vigorously agitate and aerate the water, removing the leftover radon. The now purified water is pumped and repressurized for use while the gases released from this process are exhausted safely to the outside air.